The following text is a guest blog post by Bob Janssen, CTO and a founder of RES. Do you fear change? If you do, IT is not the right job for you. You will need to embrace change and innovate to stay relevant. The role of IT has always been to deliver the best services, for the lowest cost and with the highest security. For many years, enterprise IT has been on a steady path delivering this. A lot has changed, especially when you look at technology. But then, when you look at how we organize and deliver IT, not much has changed. This is becoming a major challenge if you look at megatrends like cloud computing, IT consumerization, and ever increasing complexity. This forces IT into a reactive mode – sometimes being nothing more than a digital fire brigade. Meanwhile, the top priorities for the CIO include imperatives like alignment with the business, time-to-market, cost reduction and business agility. These initiatives are doomed to fail if the underlying IT challenges are not properly addressed first. The Digital Workspace is the most effective way of addressing these IT challenges. The Digital Workspace provides every enterprise user with secure, anytime / anywhere access to any application on any endpoint device or cloud. It all starts with configuring and delivering the Digital Workspace. This is where you start by bringing all applications, printers, and data under tight control. Don’t try to manage the user, but manage what you deliver to the user. It will improve the user experience drastically and reduce administrative overhead. 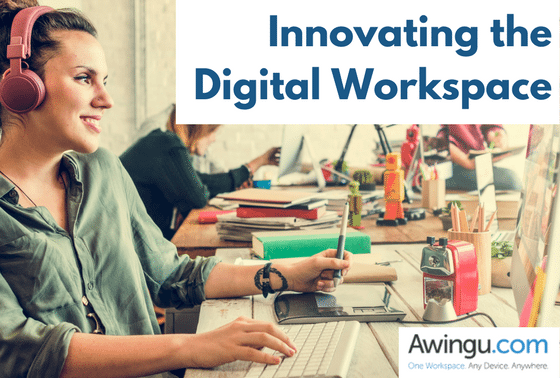 Once the Digital Workspace is created it’s important to make the Digital Workspace a safe work environment for users. By removing local administrative privileges and controlling what can be used, ransomware is less likely to succeed. This reduces risk and increases productivity. Governance of the Digital Workspace will take care of staying compliant with software licenses without overspending and tracking what is being used in the Digital Workspace. You are now well on your way to innovate the Digital Workspace! Next, is automating recurring tasks within the IT department. Doing so will reduce cost, allow first line support to take care of more complex problems, and will make life interesting again for all IT people. The automation should be easy and intuitive to use and should never add more complexity. The automation will be the foundation for the ultimate delegation of IT tasks: self-servicing for users. Not only will this deliver a great user experience (IT consumerization to the max) but it will also drastically reduce service desk tickets and improve the quality of service. The final step in innovating the Digital Workspace is implementing proper onboarding of new employees and offboarding of ex-employees. Often this is mistaken for identity management, but in practice, it is all about logistics and workflow. Taking this pragmatic approach will give you results in weeks instead of months or even years. The outcome will be fast and secure on and offboarding. Creating, securing, and automating the Digital Workspace is independent of the underlying delivery technology. Delivery can traditionally be done with physical laptops, tablets, and desktops, or more advanced with virtual desktops or from the public cloud. Modern options for delivering Digital Workspaces include Microsoft Windows 10, Citrix XenApp Express, Amazon WorkSpaces and VMware Horizon. Also, worth mentioning are recent initiatives for delivering Online Workspaces (Awingu, New Day At Work). Many organizations went before you have taken this Digital Workspace journey. They now enjoy IT that delivers an exceptional end user experience, provides people-centric security, offers self-servicing, predictability and full automation with lower IT and business costs, increased productivity, improved security, and compliance. Do you fear change? Or do you enable IT to enable the business? Visit res.com and learn how! MICROSOFT ANNOUNCES WINDOWS VIRTUAL DESKTOP (WVD): WHY SHOULD WE AND YOU CARE? Awingu develops a software to simplify enterprise mobility and liberate legacy applications. Our software aggregates all company files and applications to one secure online workspace that can be accessed from any device or OS using any HTML5-based browser.